Macro Fiber Optic Light Guide Kit. Customizable assemblies include lens mount ring threaded for M42, T mount or M39 (Leica) or a combination of any two. 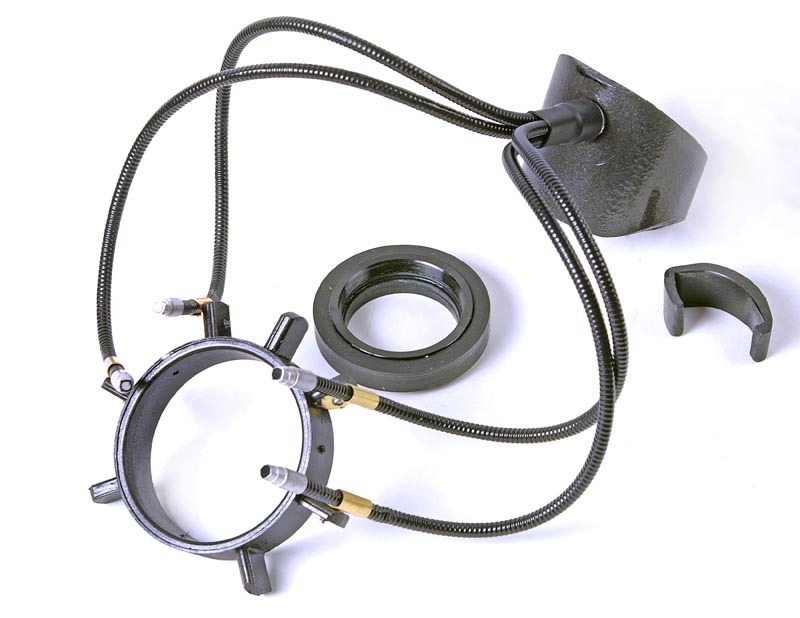 Fiber optic adapter ring mounts to lens adapter ring and has bosses for up to seven point light locations. Camera mount assembly fits securely to the camera with a tension clip without damage or tools needed. Currently, the Camera mount assembly is available for the KM 7D and 5D and the Sony Alpha 100. I do not have access to a A700 yet so an adapter for that camera is in the future. Design is Copyright December 20, 2007 by Pete Ganzel and cannot be copied commercially without permission. I can build these with about 1 week notice and depending on availability of B&L light guide. Please e-mail me for availability. Add $30 for each lens mount adapter (M42/T mount/Leica M39)of your choice. Custom adapters can be made for any lens.